The spatial resolution (dimension of the IFOV) ranges from 50 km at 18.7GHz to 10 km for the highest frequency channels. The MicroWave Imager will provide precipitation monitoring as well as sea ice extent information. The microwave radiation from the scene is collected by the antenna reflector and focused to the respective horns. 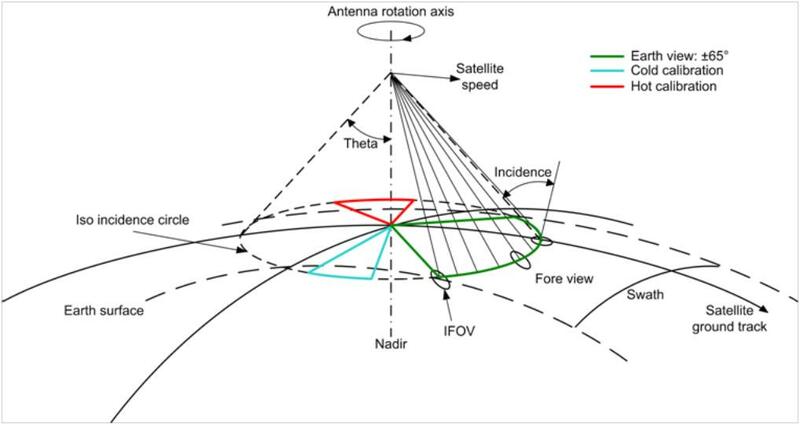 The scene is scanned by rotation of the complete antenna i.e. the reflector and the horns. Every rotation, the angular sector where the antenna beam looks at the platform is used to calibrate the receivers. A calibration mirror is used to collect the energy coming from the cold sky. An On Board Calibration hot Target (OBCT) allows to have another calibration point. These elements constitute the Calibration Assembly (CA). The OBCT is a known temperature, black body source, passively controlled but intended to take up the temperature of the MWI Instrument Main Reflector in order to radiate at a well-known temperature. It forms one point of a 2-point calibration system (the other point being the Cold Reflector focusing the radiation from the deep space into the instrument feeds), which are viewed by the radiometer and with which the Earth scene is compared. For part of each revolution of the Instrument RF Assembly, the feeds are faced to the OBCT, which exhibits a near-uniform temperature and low reflection losses by virtue of its microwave absorbing surface. The OBCT is a device acting as microwave approximate black-body (emissivity very close to unit) over the operative range of interest (cm < λ < sub-mm). The OBCT is aimed at providing a reference signal periodically filling the antenna FOV (Field-of-View) of the instrument feed cluster, allowing continuous calibration during flight operations. The general OBCT design shall basically consist of a bed of absorbing elements (pyramids), opportunely shaped in order to match free space impedance, enclosed in a metal baffle. After taking part to an intenational Invitation To Tender (ITT), promoted by the European Space Agency (ESA), Pasquali MS has been selecteda among many candidates as the Contactor company for the procurement of the OBCT assembly; this activity includes the complete (RF, thermal and mechanical) design, the manufacturing and overall testing of the Unit, in full compliance with the applicable rules for space flight devices.